Imagine having a bad day. You open the mailbox and inside is a hug from an old friend. A beautifully packaged box filled with treats to make you smile along with a sweet note of support. This is exactly the kind of service The Hug Box provides every day. We were so excited to get the chance to speak with Vicki Wahl Sanders, founder of the Hug Box. The idea for a gift box that is more personal than the standard basket stuffed with generic items came to Vicki fifteen years ago. At the time, she was steeped in corporate culture working as a graphic designer. While she found many positive aspects to this job, it didn’t touch on her desire to give back to her community. The opportunity to embark on a new journey came four years ago when she unexpectedly lost her job. She remembered the idea of sendable hugs that she had jotted down in her journal so many years ago. The Hug Box became a business where she could put her desire to give back into practice. As we looked at the shelves of beautifully personalized gift boxes, we were astounded at the care that went into selecting each item in the boxes as well as the packaging. 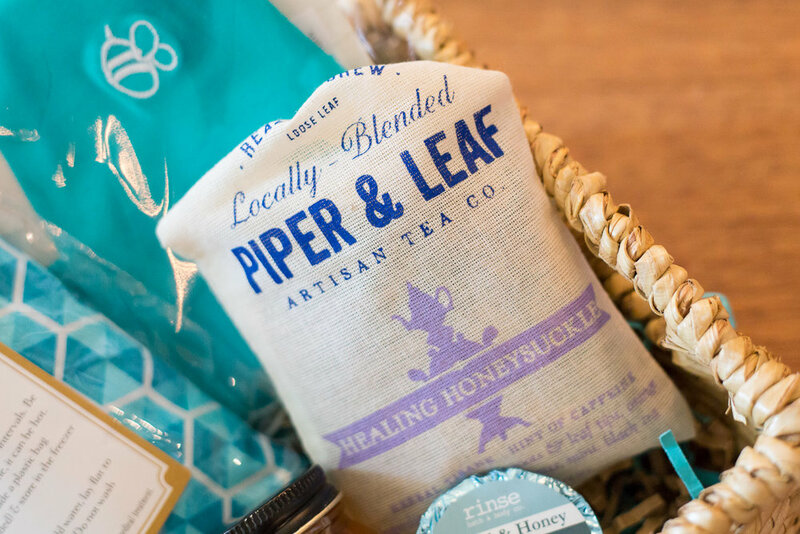 Every aspect of a Hug Box, from the ribbon it’s tied with to the carefully crafted goodies inside, is focused on sustainability and supporting local businesses. The artisans that produce the unique, one of a kind products that go into each Hug Box are located somewhere in the United States and source their materials ethically and sustainably. Vicki also looks for artisans that use all natural materials and give back to the community. The pretty and simple packaging is all made from recycled materials. “I didn’t print on it in the hope the receiver will reuse it." says Vicki. Her graphic design background shows in the cute and cohesive branding of The Hug Box. When you decide to send someone a hug, you can choose an occasion, such as cheer up or new baby. Nestled in your box are handmade gifts, like organic tea or a hand knit coffee sleeve, that can’t be found at just any store. Vicki wanted to include things that are useful and will make your friend think about you and the warm feelings a hug inspires every time they use the item. Vicki is also happy to help you put together a custom box for your loved one. At the moment, a portion of the Hug Box sales go to Camp Sunshine and Atlanta Pet Rescue. Vicki plans to continue to increase her charitable donations as her business grows. We loved the passion she has for spreading warmth and joy in the world and supporting small businesses. You can make someone’s day with a packaged hug by visiting her website. You can also find The Hug Box on Facebook and Twitter.